He may have scored twice during the week but Daniel Sturridge isn’t happy at being asked to play out wide. Sturridge scored twice against Burton on Tuesday. The England striker started last weekend’s defeat to Burnley on the wing and was then deployed on the right after coming on during the EFL Cup win over Burton Albion on Tuesday. 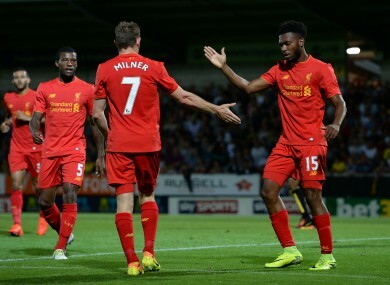 Sturridge scored a brace at the Pirelli Stadium but then voiced his unhappiness at not getting the chance to operate in his favoured position, with Divock Origi playing in the central role. “Of course it is more difficult for me to play wide. I’m a centre-forward. In the modern day game you have to try and be flexible but everyone knows my best position,” he told The Guardian. “Everyone knows where I enjoy playing the most. I’m a player who plays on instinct, and in the middle I have clarity on movements and things that I have been doing for years. I am on autopilot there. You just do things because you are used to doing it. Having missed the opening game of the season through injury, Sturridge returned at Burnley but struggled to make an impression and was replaced after an hour. Email “'I have to do a job for the team. That's not saying I am happy to do it' ”. Feedback on “'I have to do a job for the team. That's not saying I am happy to do it' ”.